Tea is a salubrious drink. A what? Tea, high quality tea, is a health giving drink. Camellia Sinensis is the scientific name for the shrub or tree whose leaves and buds are used to produce tea. The origin of the tea plant dates back to ancient China. That was the place on earth selected by the universe for tea to call its first home. Tea was native to China and spread from there. It is important to note that tea was first consumed for its medicinal properties. And it was the task of the monks to ceremoniously care for the tea. Such a hallowed drink. Today the many benefits of drinking tea are not a secret. There are many, many scientific articles published on the benefits of drinking tea. With its many polyphenols, flavonoids, catachins, tea is high in antioxidants good for reducing the risk of cancer. The properties of tea maintain heart health and reduce the risk of heart attack and stroke. Tea can lower blood pressure, cholesterol and diabetes. Tea has been linked to liver health. It helps with weight loss, increasing metabolism, and aids in bone health and healthy teeth. It's great for good skin and mental alertness. Reduces the risk of depression. And increases total mortality. So click your heals, and jump up. Make it your healthy habit. Drink tea and enjoy life. Waterfall at the top of Horsehead Cliff in Wuyi Mountain where a special Rou Gui grows with a perfect balance of yin (moon) and yang (sun). Cared for by Tea Master Zhou. The mist surrounds and kisses me. The tea trees join my being and call me to rest. And the sun and moon gives rise to nourish and bless. Come with me to the dance of the tea leaves. A respite, as our daughter in law is alive with the beauty of the Mountain. Something magical happens around the tea table. Wuyi Mountain. Photo taken from our Sept 2015 visit. In the northwest province of Fujian there is Wuyi Mountain with 7,080 ft. elevations. A wonder. Where the richness of its biodiversity in floral and fauna, along with the tea trees growing in the decayed volcanic rock amongst waterfalls, has been preserved since ancient times. First cared for by the Taoist Monks, protected by the Chinese government and pronounced in 1999 as a UNESCO World Heritage Site. Enveloped by the mountains, humid with rain and the year round mist of fog and clouds, a microclimate designed by the gods has been created. Water so pure and the earth so rich in minerals from the rocks. It is here that some of the best teas on earth call home. There it was in How to Spend It, the luxury lifestyle magazine distributed globally with the Financial Times. “Tea’s New Finesse”. An article sourced by Alice Lascelles , August 18, 2016. “Tea is now being sourced, served and appreciated with as much connoisseurship as fine wine”, reported Alice. My husband’s excitement grew as he read through the article and did a fast rewind back to a Monocle Magazine “Retail Special:Tea Emporiums - Film” from July 9, 2015. Now, my husband and myself had been drinking great tea since 2004, when we met Dr. Ming Wu, third generation Traditional Chinese Medical Doctor and Herbalist. He was raised in the tea culture of Chaozhou, China. And his good fortune to come upon China’s highest quality, rare, wild and pure, limited production teas, was shared with us. So my husband researched some of the tea shops featured in the How to Spend it article and Monocle’s review. One proprietor touted they were the first tea company to provide the information from where the tea came. He was also noted in the article as saying that when buying Chinese teas you have to have a lot of information or you may not be buying the real thing. We found this tea company to be very credible. Another proprietor touted that Rene Redzepi, two Michelin starred chef, loved one of her teas as his favorite tea. And of course. My husband had to taste their teas. He had to find out how good our tea, the tea we knew to be good and had been accustomed to drinking, was in comparison to these teas gaining notoriety and endorsement. So he did what any true tea drinking connoisseur would do. He bought tea from each of the tea companies. Matching the same tea to ours by their category and cultivar, spending over $900 for tea tastings. And over eight hours of tea tasting time. One afternoon, we had Dr Wu clear his calendar and join us for a tea tasting comparison. From 1:00 p.m. in the afternoon that day till 9:00 p.m. at night . We drank and compared the taste and quality of each tea. And that propelled us into formally offering tea via our SonWu brand. A collaboration between Vinson and Wu, surnames of the partnership. What we discovered from our tea tastings, blew our minds. These competitor teas were for the most part commercial grade, for the mass market, and sprayed with chemicals. And only one tea companies’ tea was found to be true and acceptable as advertised ….non chemical and high mountain tea. We continue to taste others’ teas. Searching through NYC, LA and China. We know that not everyone may be able to drink true, pure, high grade, wild grown, limited production, Tea Master rare teas. But it has been our good fortune that we can. So now we offer it to you. If your path crosses our path, then the Universe has granted you an encounter that you can choose to embrace or ignore. But the intersection of goodness, health, well being and gratitude, can be yours. Try SonWu Tea and see what a difference good tea can make in your life. He is a third generation Traditional Chinese Medical Doctor and Herbalist. His grandfather and father were Traditional Chinese Medical Doctors and Herbalists, too. Ming learned many of the ancient remedies of herbal formulas from his dad. And at the tender age of 7 years old, Ming started training with his dad as a serious student of Taoist TCM practices. This included herbal medicine, acupressure in the ancient art of Tui Na, Qi Gong, and Tai Chi of which he is a Master. And of course, the custom of drinking tea for its health giving properties and pleasure. Tea Master Zheng at his Tea House in Guangzhou, China. Tea Master Zheng is a quiet, kind, gentle and humble man, deeply connected to tea and China’s ancient cultural practices. After giving up a very successful communications business he has dedicated his life to the practice and art of tea making. He’s been studying over 20 years with some of the best tea masters in Yunnan learning the ancient spiritual tea making techniques and Taoism. Tea without spirit, is not real tea. The puerh teas he makes are from very old tea trees, many 350+ years old. It is their age that gives them the power and nutrients to move your qi and heal. And the spiritual connection that Master Zheng has with the tea allows their essence to be freed. His life’s dedication to tea is revealed in the friendship he built with a 90 year old tea farmer. Master Zheng met this man who had tea from a 1000 year old tea tree. And Master Zheng courted him over 3 years in hopes that he would be allowed one day to taste the tea from his tree. And as his karma would have it, he was eventually able to get some of this amazing tea. He graciously shared it with our good friend Ming, as Ming understood and recognized the depth of the tea. And Ming shared it with us. For two hours we had the experience of drinking his tea. Unfortunately, the tea is not available for sale. Only a select few have enjoyed this old man’s tea. 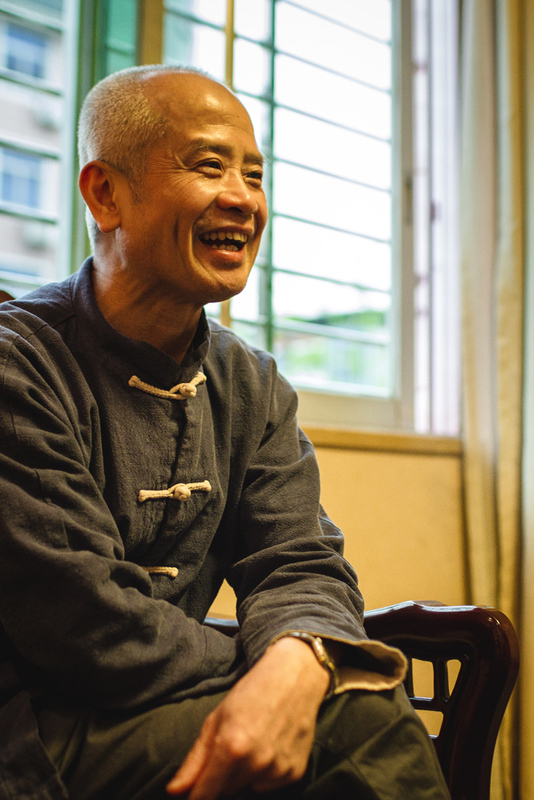 Master Zheng is on a mission to preserve China’s ancient cultural practices one of which is the tea ceremony and the art of making and drinking tea. Master Zheng has payed attention to every detail in designing his Tea House. He merges the life and beauty of reclaimed wood from ships with beautifully designed stone tea tables and magnificent tea. His Tea House is really a masterpiece to be seen, felt and shared. Photo taken at a Tea Ceremony hosted by Master Zheng at his Tea House during an evening's Chinese Cultural Event. We were so fortunate to be his invited guests. Meet Tea Master Zheng at his Tea House in Guangzhou, China along with Michele, Ming and Nathaniel. Feel the Spirit of Tea as the delicate beauty of the tea and its surroundings draws you to its center. Let the gentle waterfall of tea wash through your soul as it is poured. Let the soft images and music bring you to a serene mood. And most of all, let it move you to take time, drink the tea and let it be your meditation. Tea Master Zheng and Nathaniel Vinson at Master Zheng's Tea House in Wuyi Mountain. We spent 2 1/2 days with Tea Master Zhou. Sitting with him as he served us tea at his tea room, going to his tea factory, and walking among his tea trees high in the center of Wuyi Mountain. The first day, we accompanied him as he checked on the tea leaves to see when they would be ready to pick. The leaves must be picked at the exact right time to ensure a great tasting tea. It was breathe taking, captivating and invigorating. It is astounding as you stand above the city below. Wuyishan City, taken from a view from on top of Wuyi Mountain. Our second trip up the mountain, was the day before we left. We watched them pick the tea, carry it down the mountain and drop it off at his tea factory, where the serious process of making the tea began. We were exhausted and had to leave early the next day so we did not stay with Master Zhou as he spent all night with the tea. He will not leave the tea for at least 10 days and nights while he is processing it. He does not sleep, till his final batch is prepared. Tea Master Zheng & Nathaniel at his Tea House Wuyi Mountain. We really had a lot of fun being with him. He was so kind to spend so much time with us. He has a lot of energy. And patience, as we strained between our english and Chinese “wechat” translations in order to communicate with Tea Master Zhou when Ming was not there. We witnessed and felt his passion for the tea. We also met his wife who graciously served us tea, too. Tea Master Zheng serving us tea. Master Zhou is a native of Wuyi Shan Village, now about 42 years old. He started making tea at the age of 17. His Tea Master was Yi Timpa. When asked what drew him to his practice of tea making, he said, “When I was young, I liked drinking tea”. He added, “It was hard work, it took a lot of training and many years”. Tea Master Zheng serving tea. All the tea he makes is from his own trees, except for the Zheng Shan Xiao Zhong, which a tea tree owner from the protected side of Wuyi Mountain brings him the tea leaves to process. Tea Master Zhou charcoal bakes his teas at least 5 times. “If you bake the tea less than five times, the tea is not good”, he stated. “You have to open the tea till it comes alive”. “A good clay pot should become your private, special aged possession. Even if you run out of tea, if you just put water in it, the water will taste like tea. This is a must have”. “Tea making is like art work, because every time you make it, it can’t come out the same”. “The tea must be picked at exactly the right time. You must check it every day until it is ready. All hand picked, only 1 time a year in the spring”. Tea Master Zhou employs about 15 people who help him during the tea picking season. He tells us that 80% of the tea in the Wuyishan market is not real WuYi Tea because it is not grown on the mountain. Master Zhou can grow on the mountain because he’s from the village. There are about 5,000 tea distributers in the city, but only 10 of them have the real Wuyishan Mountain rock cliff tea. Master Zhou does nothing to nourish the trees. It is all by nature. He has trees that are at the top of the center of the mountain. The center and top of the mountain is the optimal location for tea trees to produce the highest quality of tea. Master Zhou’s tea is exclusive to SonWu Tea in the U.S. We are the only people outside of China to have his tea. And now we offer it to you. Much love and heartfelt thanks to Master Zhou. From Left: Dr. Ming Wu, Tea Master Zhou, Nathaniel Vinson, Michele Vinson at Tea Master Zhou's Tea House in Wuyi Mountain. Tea Master Xu's factory and warehouse on Wuyi Mountain. We visited Tea Master Xu, at his factory and warehouse in Wuyi Mountain. As a native villager of Wuyi Mountain he owns trees on different areas of the Mountain. Tea Master Xu and his wife Lai at our visit to their tea factory and warehouse in Wuyi Mountain. It was there in his tea room at his factory and warehouse that he and his wife, Lai, served us tea. We felt so honored to be there. We totally enjoyed the tea, and their company. We listened tentatively, in awe, asked questions, and hung on every word spoken by Ming, whom we relied on heavily to interpret. We were given a tour of his factory and warehouse. Just as we were setting out on the mountain, Master Xu was interrupted and whisked away by an important phone call. So it was Lai his wife who took his place and walked us up the area outside their factory. She is so kind and sweet. From left, Dr. Ming Wu, Tea Master Xu, his Uncle, Nathaniel & Michele Vinson outside their tea factory and warehouse in Wuyi Mountain. Master Xu formally studied at Fujian Agriculture and Forestry University. And can you guess? He majored in the study of tea. But he started his journey with tea when just 15 years old. His Uncle was a tea master from whom he also learned and was mentored. It was along with his uncle and cousin that they started their family tea business. Master Xu is actually quite a famous tea master. He was one of the last tea masters that tended to the original six famous Da Hong Pao tea trees that now are over 380 years old. So precious and valued is this tea that it was stored in vaults and only the president and other heads of state were allowed to drink it. Master Xu at his factory and warehouse in Wuyi Mountain taken from our tour. But I must say his teas are also pure, in the meaning of uncontaminated, clean, unpolluted. No chemicals, fertilizers or sprays ever touch his tea trees. He relies on the universe and richness of the earth to nourish them. They grow in the red clay and high rocks of Wuyi Mountain. And in the center of Wuyi is where the highest quality teas are found. This purity and cleanliness continues from the mountain into his factory and warehouse, where he maintains pristine conditions for processing and storage. He has no problem drinking the first pour off of his tea. He says "his tea is so clean, and he likes the taste and the caffeine of it as well". One of our favorite photos taken from our visit to his factory and warehouse at Wuyi Mountain, where he hosted us in his tea room. Making tea is an art. The energy and spirit of the tea master imbibes the tea. Master Xu put three months of his energy into processing his Da Hong Pao Tea. He said, "it is during the processing that he brings out the flower in the tea as he makes it". We spent the entire afternoon and evening with he and his wife. As we finished our tour and tea tasting they graciously invited us to dinner. We could not convince them to let us treat them, so we continued as their guests. We had the greatest of times. Not only was the local food so delicious, their company meant so much to us. They are both very sweet, kind and gentle. And don’t let Master Xu’s seriousness at times fool you. He has a great smile, a laughing heart and an enjoyable spirit. We are so fortunate to be able to have his teas and offer them to others. There are only two companies outside of China that has his tea. SonWu Tea and one other London based tea company. We love Master Xu and Lai. And we love their tea. We hope you will enjoy it too. This is our friend Shaoli's baby, from China. And she is literally drinking our tea. Our teas are pure. Chemical free. Grown by nature. Grown in pure soils. Our tea masters tell us that is all that is needed. Our Wuyi Mountain teas are grown in the inner circle of Wuyi Mountain. At the center top of the mountain. Sometimes referred to as the Zhengyan area. Dating back to the VIII Century, Wuyi Mountain and forests were protected under emperors orders. And this protection is still maintained to this day by the Chinese Government. In 1999 the Zhengyan area of Wuyi Mountain was inscribed as a UNESCO World Heritage Site. It is a natural reserve where no chemicals are allowed. There are virgin forests protected for wildlife, floral and "tea". Spend time up the mountain and experience the clean freshness first hand. It is invigorating. Rivers, and waterfalls so pure, surrounded by the floral, and fauna. It is breath taking. We are very fortunate, as we visited the mountain with our tea masters and friends. And spent time at their small acreage farms. We only offer to you, those teas that we ourselves drink. So it is without hesitation and in a true conscience, that we stand behind our teas. And it is without hesitation and in a true conscience we can say.........Teas So Pure A Baby Can Drink. So where do you start when it comes to choosing a tea? There are so many varieties and from so many places. My husband always has said, it is like choosing a wine. The type or variety of a tea, relates to the type or variety of a grape. The tea master, relates to the vintner. The country, location and estate of a wine relates to the country, location and tea farm. All of this relates to the environment, growing conditions, climate, and soil (terroir), which has a direct effect on the taste and character of a tea, as it does to a wine. Age of the grape vines contributes to the goodness and value of a wine, as is so with the age of a tea tree. The older the tea tree the stronger the qi that is imparted from the energy absorbed from the nutrients embedded in the earth overtime. This enriches the taste and quality of the tea as it does the wine. And no two season's are exactly the same which at times defines a banner year for wine and tea. Tea making, as wine making, is an artisanal process. And no two batches of tea, even produced by the same tea master are ever exactly the same. Take for instance the many different wines, such as a cabernet sauvignon. That is the type of grape, which is grown in France, Italy, Australia, California, and Argentina. But from each country, due to its location and climate, a slightly different characteristic of the wine is produced. There is a different essence from the grape. And along with the producer or vintner, each contributes additionally to the different taste of the same type of wine. The same is so for tea. There are different teas, broadly categorized as green, black, oolong, white or puer. And within each category there are varieties. And who produces the tea, and how and where the tea grows contributes to its taste, essence and rating. For instance, a true Wuyi Mountain tea has a distinct flavor profile because of the rock and floral that it grows amongst. It will have a mineral flavor and floral aroma. Wuyi Mountain because of its biodiversity and climate along with its cultural practice of how they make the tea produce some of the best teas in the world. And just as wine is preferred based on individual taste, so is tea. And to understand the tea taste, you must taste the tea. Just as you must taste a wine to understand the wine. So have fun. Try the teas. Drink the teas. And enjoy the moments. 1. Boil water to cleanse and heat the cups & tea pot. 3. Pour off first infusion to rinse the tea and open the leaves. Like the Buddha. Be at peace, and drink the tea. You may read about tea and the ancient Chinese tea culture. You may research the health benefits of drinking tea. But please don't forget. Your true experience with tea will begin when you drink the tea. Spend time with the tea. And connect to the tea. Smell it. Sip it. Hold it under your tongue. Taste it. Savor it. Drink it. Slowly, calmly, in peace. Slow down and make your connection to the tea. Then expand. And enjoy the experience with others. Let it enrich your life. Let it become a way of life. You will be blessed by all that the tea has to offer.